A couple of days ago I took part in a fashion show for Global Kids Fashion Week. The event was the first of its kind in London and I got to walk the walk, on the catwalk, WOW! I felt very lucky when Amanda Rabour, Children’s wear designer and owner of Issosy Children asked me if I would like to model a suit from the Isossy Children’s SS13 collection. I had always wanted to try modelling as I had really enjoyed taking part in a few photo shoots for another brand, so here was my chance to experience catwalk…….….’All eyes on me’! Even though inside I was nervous, out-side I had to show I was as cool as a cucumber! Walking down the catwalk was FAB! I wore the Omo Boys Suit from Isossy Children’s SS13 collection. Amanda uses African and Asian prints in her work. I have always like the clothing Amanda designs, as they are different from any thing else I have seen, colourful and fun. After all of the excitement of the show, there was an After Party for everyone to enjoy. The after party was fantastic! I met some great people, had fun and ate lots of Popcorn & Candy Floss!!! This entry was posted in Boys Fashion, Opinions, style and tagged African fabric, African print suit boys, Alex and Alexa, Boy model, Child modeling, fashion, Fashion week, global kids fashion week, Isossy Children, Kid model, London, Omo suit, Runway, Spring fashion. Bookmark the permalink. 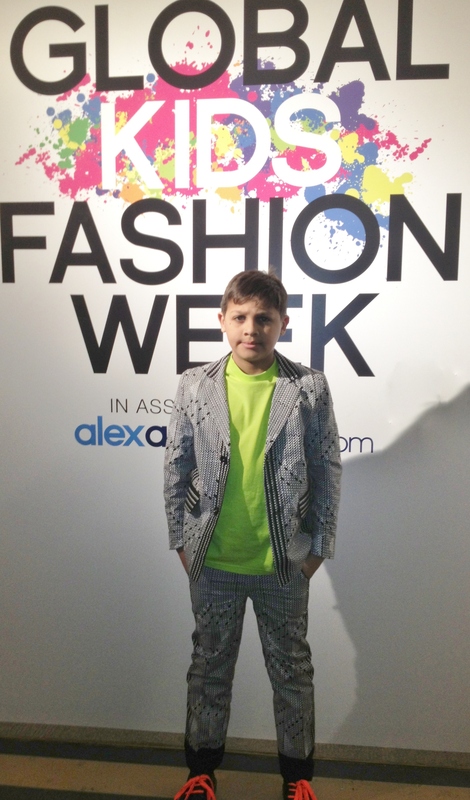 1 Response to Behind the Seams: Global Kids Fashion Week meet Eugene 10 year old kid model!